Toppan Printing Co., Ltd. (hereafter Toppan Printing; head office: Chiyoda Ward, Tokyo; President & Representative Director: Shingo Kaneko) has developed Japan’s first film for use in packaging materials that uses biomass polyethylene (PE). Full-scale sales will be launched from August 2011. In order to contribute to the realization of a sustainable society, Toppan Printing engages in the development of products that are environmentally friendly. This new product is a film that partially uses a raw material derived from sugarcane and has a biomass ratio of up to 40% (ratio by weight). While using a raw material derived from plants, the film retains the same performance as existing films in terms of properties such as shock resistance and ease of tearing. This product is being used for standing refill pouches for items such as hair care products. Copyright 2011 TOPPAN PRINTING CO., LTD.
Biomass plastic is a renewable resource that uses plant-based raw materials and can be used sustainably. It can contribute to the creation of a sustainable society as it enables a reduction in the use of fossil resources such as oil. In addition, since it is considered that the volume of CO2 generated during incineration and the volume absorbed during the growth of the plant cancel each other out, it is receiving attention as an environmentally friendly material that can reduce CO2 emissions in comparison with oil-based plastics. As an initiative to mitigate global warming and reduce the use of oil, since 1991 Toppan Printing has been engaged in the development and commercialization of packaging materials using biomass plastics. In addition, Toppan Printing developed biomass packaging using polylactate in 2000 and it was adopted for the outer packaging for home electrical appliances. Since then, it has been used widely in sectors such as the food and clothing industries. Polyethylene is a material that is the base for many types of flexible packaging. With the development of this biomass polyethylene film, it has become possible for the first time in Japan to provide biomass packaging materials in all areas of flexible packaging. This product achieves a reduction in the use of oil by replacing oil-based linear low-density polyethylene (LLDPE) with a film that partially uses LLDPE derived from sugar cane. For example, in the case of a standing refill pouch that uses the new film, by replacing part of the oil-based LLDPE that accounts for around 75% of the total material with LLDPE derived from sugar cane, it is possible to reduce CO2 emissions during incineration by up to 40%(*). The film retains the same properties and suitability for processing as existing PE film and is ideal for packaging for everyday items such as shampoo and food products such as seasonings. Toppan Printing is targeting sales of 12 billion yen in fiscal 2015 for its biomass plastic product business as a whole. 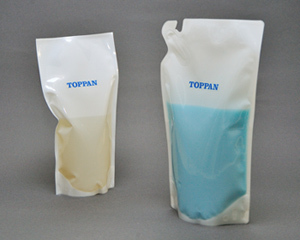 Using the know-how acquired in the development of this product, Toppan Printing will aim to expand the use of biomass PE as a packaging material for other products and proactively advance the development of packaging using biomass plastics such as biomass high-density polyethylene (HDPE), polylactate, and biomass PET. * When 1 kg of this product with a typical structure is incinerated, 2.95 kg of CO2 derived from plastic is generated. If the percentage of biomass in the product is 40%, the volume of biomass-derived CO2 released is 1.25 kg. Because the CO2 derived from biomass is not counted, there is a 42.4% reduction (1.25/2.95=42.4%). If the CO2 derived from ink and adhesives is included, the final CO2 reduction is around 40%.